Multifruit 81 isn’t your average online fruit slot; it’s more like a blender. I say that because Play n Go’s 81 pay line classic fruity can juice your money in minutes. But that’s not to say you can’t get your 5 a day. At 96.55% RTP it’s up there on payout rate. You can cover a massive pay table from just 10p a spin and with wild multipliers, well, they multiply your wins. 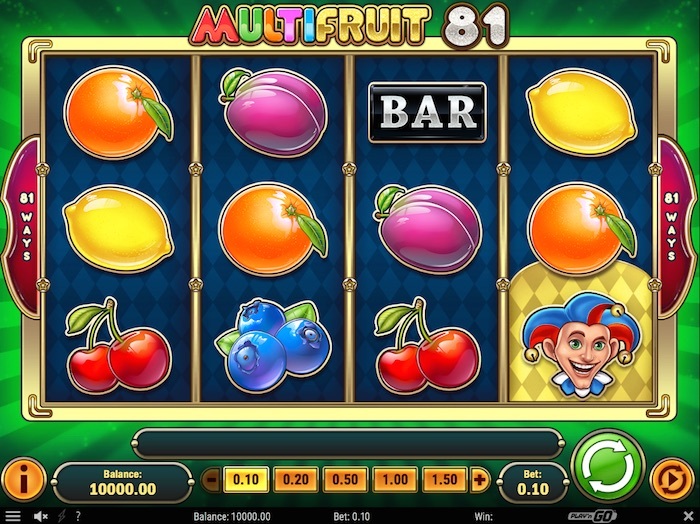 If you like your fruits with jokers, the Multifruit 81 slot pays out when they come together! Play n Go Multifruit 81 is a 4 reel classic slot that uses Joker wilds to add to winnings. The design is basic, but the pay table is complex. For players like you and me that means plenty of potential wins, but there’s high variance with it. You could play this type of game and not even notice your credits getting juiced, especially with bets up to £100. What’s attractive about Multifruit 81 is the old fruit machine look. It’s easy to control, managing bets is simple and joker combos can be really sweeten the fruity payouts. If you’re playing online fruit slots for 10p, just consider the return value in Multifruit 81. Everything about this slot is multiplication, and of course that big pay table (81 pay lines). Rarely have we seen that kind of return value for 10p (lowest bet). But it could cost lots bets to see anything. The fruit wins can be small on their own, but Joker wilds play their part to boost payout. I’ll explain how the game works later. You can play from 10p to £100 a spin with designated pay table wins that change when the betting stake changes. It’s a nice feature, as this explains exactly what you’ll win in the currency you are playing. Real money slots players can cover 81 win lines with just 10p, that’s a good deal from any pay table. Multifruit 81 features 4 reels, that’s because it needs the space for all those winning lines. In this review, I’ll tell you the lowest and highest wins without multiplication. If you get jokers on the day, it’s an added bonus of either two or five times the win. The pay table is a mixture of classic slot symbols including mass majority fruits (low value) and high value symbols (7’s and bars). The Joker is the wild symbol. Not only can the Joker help create wins (wild function), but it can also multiply them. To see the scale of the payout table, 10p spins would return the following wins. 4 x 7’s would return £10.00 whilst 3 x lemons would return £0.05. We’re not sure about the total jackpot for this slot, as the multipliers help out too. But a win of 4 x jokers would be considerate (500 x Jackpot). For 10p a spin, that would be £50. Most new online slots come equipped with 10 – 25 pay lines, a select few with hundreds. Play n Go plant Multifruit 81 in the middle with a fairly high number. The amount of ways to win is the games main design feature. Stepping away from free spin bonuses and above base-game features, this slot uses winning multiplication to substitute. It’s got wilds, nice touch, but in Multifruit81 they do more than just win. If you want to play slots online for 10p that use wild multipliers and expanding wilds, look no further. We’ve got them both here but with 81 fixed pay lines driving the game. The Wild Joker doesn’t just substitute for all other symbols, it can multiply. What’s good about this is for 2 joker wilds in a pay line you get 2 x the win, 3 joker wilds and its 5 x the win. If playing for £2.00 a spin, a small win of £10 could quickly become £50.00. Note: A pay line of 4 jokers isn’t multiplied. But as the Multifruit 81 jackpot do we really care. Four jokers award 500 x betting stake. The expanding wild is another useful add-on. I say this because there’s so many ways to win playing this game. So filling up one reel with wilds can cover a lot of ground. How does it work? It’s random, and it happens before every spin. A reel is selected (highlighted) and the slot spins (you press play). We’re looking for a Joker wild in the highlighted reel. If we get one, it expands to cover the entire reel. Expanding wilds are nice to see on 20 pay line slots, let alone 81. You’d be foolish to overlook the simplicity of the Multifruit81 slot. Ok, it’s not rammed with features, but players want winning lines. Few 10p slot games offer the amount of win lines and the multiplication of win lines. Who needs features when you’ve got fruit? You’re getting lots of ground for 10p spins on this one. Thanks to 4 reels, the Play n Go upgrade to the classic slot offers 3 x 3 x 3 x 3 ways you can win. Yes 81. Betting levels vary from 10p through to £100 a spin. If you want the jackpot, it’s 500 x your betting stake and you’ll need four jokers to get it. But there’s plenty of fruit instead, unfortunately they pay much less. Top tip, avoid lemons and cherries. RTP is promising at 96.55%, slightly above average compared to other new online slots. Fruit machines and online classic slots are ten a penny. But few can match this one for 10p. It’s not so much the fruit or the retro style that makes Multifruit 81 appealing. It’s the opportunities that Play n Go has put in it. If you keep bets low and avoid the portions of pathetic fruit wins, you might just see the joker smile. Don’t get excited about cherries and lemons, look out for bar and 7’s with joker multipliers. Lots of pay lines with a strong multiplier function, we like this one. Read our case study – we played £40 in £2 spins on this game, did we win? See Multifruit81 slot case study.